Lambert, Stephen. Good. A rhyming dialogue between a small boy and his grandmother about the wonders of the earth, sea and sky. 32 p. Colour illustrations. Intended for a juvenile audience. Very Good. 32 p. Col.ill. Intended for a juvenile audience. A simple rhyming dialogue between a small boy and his grandmother at bedtime provides the basis of this picture book. They talk about the earth and some of its most intriguing wonders. Stephen Lambert has also illustrated "The Snow Maiden", "The Magpie and the Star" and "Fly by Night". Very Good. 059067983X Ships from Tennessee, usually the same or next day. Fine. 059067983X Ships from Tennessee, usually the same or next day. 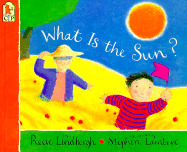 All Editions of What is the Sun?